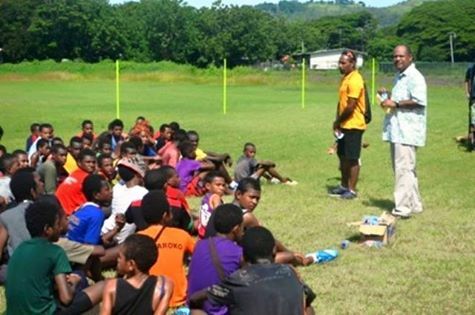 Close to 100 children in Port Moresby turned up at the Bisini’s Colts oval to have fun as AFL PNG launched its 2016 Niukick Junior program with a Gala Day. Apart from the kids learning the basics of AFL they were also educated on various issues such as Drugs, Alcohol and Sports Medicine by officers from the National Youth Development Authority and NCDC Youth Desk. Lawrence Tau of NYDA urged the children not to get themselves involved with drugs and alcohol as it is harmful to their health while his colleague Nelson Gideon who is the Acting Youth in Sports Coordinator for NYDA gave tips on how sports can help a young person excel in life and be a better person in their own homes and communities. Mr Gideon told the kids that sports is an important aspect of a young life because it helps instil positive attitudes, encourages youngsters to become team players, improve or build skill level and helps youngsters to deal with pressure.